If you’re thinking stanzaically (as I obsessively am), you also see an appropriation of this stanza linking. 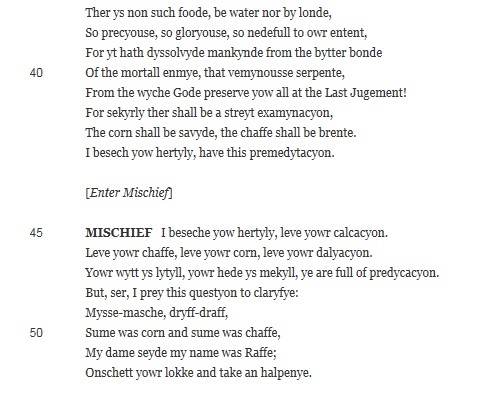 Mischief seizes Mercy’s c-rhyme and uses it to begin a tail-rhyme stanza which rhymes aaabcccb. As we shift suddenly from virtue to vice, the stanzas shift from one type of eight-line stanza to another. One is virtuous octaves, the other is scurrilous tail-rhyme. This is somewhat peculiar, as Rhiannon Purdie has shown the “lyrical, pious and didactic associations of the tail-rhyme stanza” in her recent study. But in Middle English morality plays it seems to be associated with the vice characters and with the imminent fall into sin of the central protagonist(s). Here Mankind is drawn into a tail-rhyme pattern even as he is still defending himself against the obscenity of the vices. Cleverly, the verse-form shifts ahead of his fall. The audience have confirmed, stanzaically, what they already know to be coming: Mankind’s fall into vice. Similar effects are found in other plays. 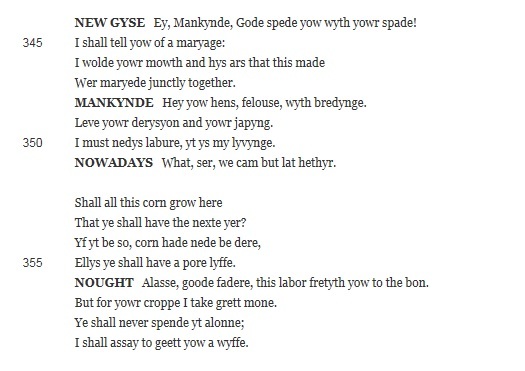 In the morality play Wisdom, the characters of Wisdom and Anima begin by speaking in octaves, and the protagonist faculties Mind, Will and Understanding join them in this stanza pattern. When Lucifer appears, he, in contrast, speaks in tail-rhyme stanzas aaabaaab. As in Mankind, Mind and Understanding switch to tail-rhyme spontaneously at line 381, even though nothing has happened beyond Lucifer disguising himself as a gallant. The switch in form signals the imminent fall into sin. For the duration of their sinful behaviour, they talk in tail-rhyme, returning to octaves once Wisdom returns (in both senses) at the end of the play. Stanza-forms are here working allegorically, signalling both form and meaning. Hi Stylisticienne! I just wanted to say I’ve enjoyed your latest blog posts on stanzas and stanza-linking in medieval drama. I’m currently writing my MSt dissertation on ‘Three Dead Kings’ and ‘Somer Soneday’, and as both involve speeches of kings your posts have given some food for thought and further inspiration. Many thanks! Thanks for getting in touch – glad you like the posts. I’ll email you: I’d love to hear more about your work on those two extraordinary poems.